Create a unique feeding station for bluebirds and waxwings by placing this Pine Tree Farms Mealworm Banquet Seed Log in your garden. Some birds prefer to dine on mealworms and nuts, rather than traditional seed, and this fantastic log can handily attract them to your yard. A blend of dried mealworms, nuts, sunflower kernels, and cranberries provides birds the nutrition they need to thrive, while gelatin keeps the item in a convenient log form. Place this unit onto your existing Pine Tree Farms Classic Seed Log Feeder (not included), for a wonderful dining spot. Rest the log on a platform feeder to allow a wider variety of birds to access it. Keep the bluebirds and kinglets in your bird garden well fed by placing this Mealworm Banquet Seed Log in it. Made in the USA. 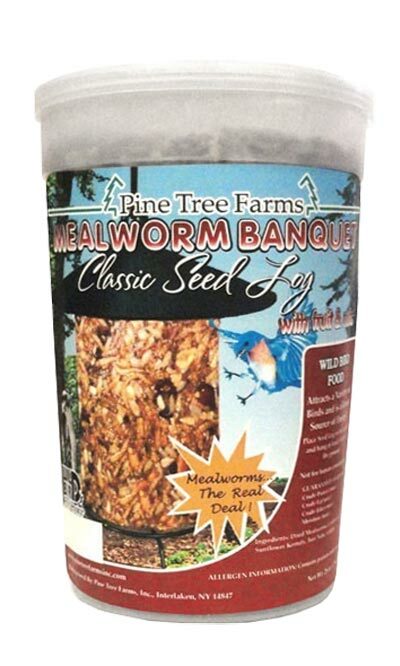 Note: This case pack includes 12 of the Pine Tree Farms Mealworm Banquet Seed Logs, 1.75 pounds each.